In Massive Darkness, you’ll join forces with the other players to enter the underground lair of the Darkness. You’ll work together, jumping from shadow to light, engaging the enemy when the moment is right. The minions of the Darkness can be anything from orcs, to goblin warriors, to giant spiders. You’ll never know what creatures await you around every corner. Play the quests in order to follow the storyline, or create your own legends using the tokens and modular board tiles. The Lightbringers won this war once before. Now it’s your turn to add your names to the history books! 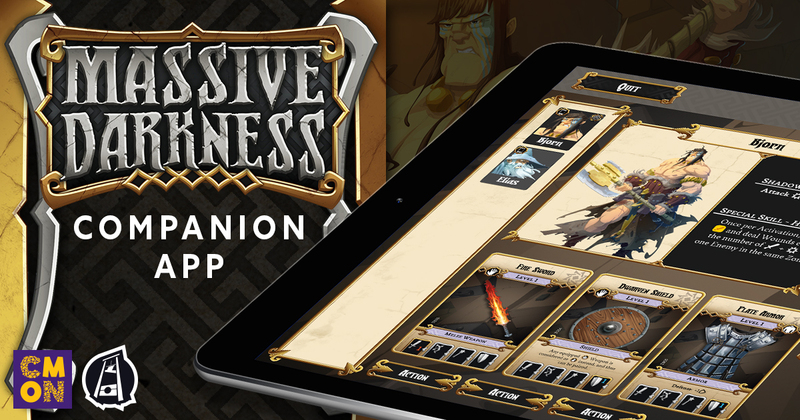 The Massive Darkness Companion App serves as a digital replacement for the Hero Dashboards used in the board game to keep track of each character’s inventory, experience and skills. And the app goes beyond that, offering players some cool extra aids as well. The Companion App is available for free for iOS and Google Play. • A virtual deck of equipment cards allows you to easily control your heroes' inventory, switching cards around with a flick of the wrist and no fear of cards slipping around. • You can also let the app control the Monster, Equipment, Door, and Event decks, for an even easier time! • As you gain experience, your new Skill options are automatically displayed, and the app incorporates any pertinent new game effects. • Having a hard time keeping track of your actions as you gain new free ones? With the Action Bar, you can tick off each specific action as you take it, so you always know what actions you have left. • Choose any of the Hero characters, including promos. • Network capabilities! Each player can use their own device if preferred, and the app will maintain the whole game-state gracefully!